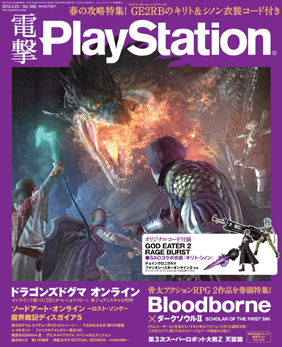 Weekly Famitsu magazine (issue dated 23rd April 2015) was just released in Japan but unfortunately the Capcom coverage is lousy this week after we were spoilt last time around. Hopefully the next issue will be better. The only thing I can report is that the PlayStation 3 version of Sengoku Basara 4 Sumeragi has jumped up to 23rd place in Weekly Famitsu's list of most wanted upcoming games. The PlayStation 4 version is now in 36th place too; it looks as though last week's big news update had a positive effect. The blow was softened a little as this fortnight's issue of Dengeki PlayStation (issue 588) recapped all of the announcements from last Thursday and added a few new screenshots. The shot which seems to depict Masamune and Yukimura teaming up against Yoshiteru for the latter's drama route (bottom of this page) is accompanied by a new one of Yoshiteru's foot in the foreground of a blazing encounter between Masamune, Yukimura and Nobunaga. His drama storyline apparently involves his search for someone worthy to be his rival, so how this might fit with the screenshots is anyone's guess. Series director Yamamoto Makoto added a few comments about Yoshiteru for Dengeki PlayStation's article. To put it plainly, Yoshiteru is the 'strongest player' in the entire series. He can be quick, strong and he can even use various elements in addition to his brand new one (quake). In his drama route, the Emperor who wields all of that power descends to being the same level as a regular citizen - that's a big problem for the land of Hinomoto (Japan). Being aware of the relationship that Shingen and Kenshin have as rivals is one of the things which spurs the isolated Yoshiteru onwards. Please take a look and see where the Emperor's journey takes him. If you mess up and don't press the buttons in time for Yoshiteru's first R2 special Inochi No Kagiroi ('Blaze Of Life'), it will heal the enemies and damage the player instead. It's hinted that if you import your save data from Sengoku Basara 4 you'll be able to unlock the skill revisions for a few characters right from the start (I guess that indicates how many medals you might expect to receive as a conversion bonus). Katakura Kojuurou will have a drama route. The magazine writers wonder how the bond between Masamune and Kojuurou will be depicted this time. Matsu will have a drama route (!). That's where the website's shots of the cooking contest to determine the greatest flavour in the land come from. The game is currently sitting in 9th place in Dengeki PlayStation's ranking of upcoming games (the voting split is 11.7% PS4, 88.3% PS3). There's one other new picture of Kanetsugu and it shows him flying into the air weirdly. Expect the new pictures to turn up on various gaming websites in the next few hours now the magazine has gone on sale. Comic SUMERAGI comes from Amazon Japan. Azure-Crimson Duel Ink Painting Illustration is from GEO. Piko Piko Masamune-kun ~Setouchi Monogatari~ (the one which looks like a classic handheld game) is from Game TSUTAYA. Basara Girls Seven is from Furuhon Ichiba. Welcome To The Wabi-Sabi Tea Party is from all other shops participating in the campaign. It's likely most import stores will be offering the final one (if any) but I'll confirm once we know the full preorder details on 18th April. If the new video doesn't appear online in a site update tonight, I guess it will follow on or around the 18th April too to help promote the preorder campaign. 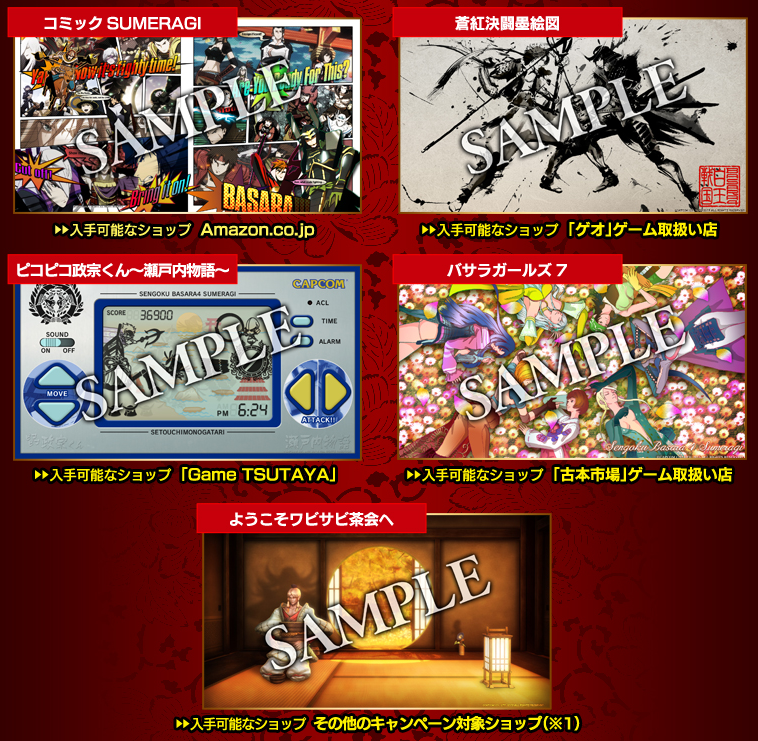 Monthly magazine Dengeki Maoh has been running extra instalments of Sengoku Basara series director YamamotoD's BASARA Sengoku HERO column from Sengoku Basara Magazine recently. It's the ongoing column where he discusses how each character was created using actual historical anecdotes as inspiration. This is great as it means they can cover characters at a quicker rate but since it's not really advertised well I had to order the issues I missed! Here are the three columns I've found so far. The column begins by looking back at the time of the first game, to when they were picking out the characters. YamamotoD said that when you simply cannot discuss the Sengoku period without Oda Nobunaga; there's nobody more famous than him amongst the historical warriors of that period. So since they obviously had to include Nobunaga, they started the design process by creating a version of him wearing western-style silver armour. They also knew right from the beginning that his image colour would be black like the historical Nobunaga. There's actually no real-life documentation which states that Nobunaga especially liked black; it's simply that his image as the 'Demon King' and his association with tea master Sen No Rikyuu (who famously favoured black over other colours) has led to him being firmly associated with the colour. The writers noted that since Rikyuu was going to be in Sengoku Basara 4 Sumeragi, fans will probably be looking forward to seeing whether there are any references to his relationship with Nobunaga. YamamotoD's favourite anecdote about the real Nobunaga is the story about how he tossed incense at his father's memorial tablet. The tales about him and Saitou Dousan have an appealing kind of chivalry about them too. There are lots of stories about the actual historical figure which leave the impression that he was very good at promoting himself. The Nobunaga of Sengoku Basara is depicted as being absolute evil, a reference to his 'Demon King' side. But he's actually been gradually transforming over the course of the series. In the first game, much of his dialogue was surprisingly humane. If Nouhime or Ranmaru fell in battle his lines would be full of regret. This began to change in Sengoku Basara 2 when Toyotomi Hideyoshi showed up. Like Hideyoshi, Nobunaga had the role of 'final boss' and he seemed to be a warrior who had cast his human emotions aside. One of Nobunaga's distinguishing features is the way he gradually loses his humanity as the series progresses. His self-centredness remains the same, but the changes are particularly noticeable in the way he speaks. In Sengoku Basara Battle Heroes, Matsunaga Hisahide asks Nobunaga whether what he wants isn't just 'chaos', but 'nothingness'. The interviewer asked whether nihilism is Nobunaga's ultimate goal, to which YamamotoD responded that what he's really looking for is 'conquest'. However, if conquering repeatedly for its own sake leads to 'nothingness', it probably doesn't bother him. In the ending of Nobunaga's Sengoku Creation route in Sengoku Basara 4, he went to conquer another world. This was a reference to the overseas conquest the real-life Nobunaga wasn't able to achieve. He recognises Nouhime as his wife, but having her at his side brings out more of 'Nobunaga's humanity'. So that's been making it harder for her to appear in the series recently. The interviewer asked why Nobunaga forgave Katsuie after the latter's rebellion in his Sengoku Basara 4 drama route. Nobunaga is a tolerant man and he acknowledges Katsuie's purity of spirit. Changing the subject slightly, Nobunaga is also fond of Ranmaru and YamamotoD suspects that Ranmaru's purity appeals to him. Yet Mitsuhide's scheming enrages him. Nobunaga understands that Mitsuhide wants to kill him but keeps him as a retainer anyway because of his tolerant spirit. In his eyes, Mitsuhide lives with him and freeloads (haha). The reason that his predictable uprisings make Nobunaga angry is because Mitsuhide is so brilliant at annoying people. In other words, Mitsuhide is probably the natural enemy of a person like Nobunaga. The introduction describes Nouhime as the series' foremost beauty in Japanese-style clothing, and begs fans not to forget about her even though she hasn't been around much recently. Back when they were creating the first Sengoku Basara game, they wanted to portray the Oda Army as a tremendously powerful enemy. Nouhime was Nobunaga's legal wife so of course she had to be there. Since he wanted to include a voluptuous female character who wore her kimono in a casual style, that mental image ended up being a perfect match. The interviewer said Nouhime was the first character they picked in the original Sengoku Basara, and to this day they remember the surprise of discovering her unique play style based on gun action. YamamotoD explained that Nouhime's movements are based on 'dance'; she twirls around and fires all over the place. Frankly speaking, her style is rather like Gun Kata. Though Nouhime is often compared to Saika Magoichi, who also wields dual pistols, if Nouhime's key phrase is 'dance' then Magoichi's would be 'modern-day mercenaries'. Speaking of Magoichi, the interviewer asked whether the reason Nouhime hasn't been featured in the game series recently is because they wanted to avoid having another gun user in the roster. YamamotoD said that this wasn't the case because the two characters play completely differently to one another. The similarities between their weapons doesn't bother the team at all. A bigger factor is that Nobunaga has been presented as more of an inhuman 'Demon King' lately, as he mentioned in the Nobunaga article above. The next question was about the changes they'd make to Nouhime if they reintroduced her now, after the gameplay improvements which were made for Sengoku Basara 3. YamamotoD confirmed that they'd have to rebuild her for the current games since everyone else's power has increased so much. He'd like to make the 'completed' Nouhime pretty strong - with more power, and more stylish Gun Kata. YamamotoD's image of the real Nouhime is of a 'manly' woman who chose Nobunaga over her father. His answer refers to a famous anecdote where Nouhime's father, Saitou Dousan, was sending her off to the Oda family as a bride. He supposedly gave his daughter a dagger and told her to kill Nobunaga with it if he turned out to be a fool (as was rumoured). Nouhime's response was to say that if Nobunaga wasn't a fool, the blade may well end up stabbing Dousan instead. This answer apparently pleased her father, who said "As expected of the Viper of Mino's daughter!" and sent her off with a laugh. The interviewer asked about the way Nouhime appears to alternate between showing and hiding her sympathy towards Oichi. He responded that she does what she has to do; even if part of her feels sympathetic, she's battling for Nobunaga's ideals and won't show her enemies any mercy. Part of what Nouhime loves about Nobunaga is that he doesn't waver. Even though she doesn't always think Nobunaga's methods are right, she's made the decision to go along with them. Nouhime's maternal side is the reason she seems so stern towards her enemies while being gentle inside. We see glimpses of her kind, motherly side in her interactions with Ranmaru and the smile during her ending in Sengoku Basara 2. In the world of Sengoku Basara 4, she'd probably view Katsuie as a pitiable child. Nouhime wouldn't usually reach out to help a traitor but she'd realise Yoshiteru incited the rebellion and aim her fury at him instead. Although she only appeared in Katsuie's anime ending, if things had turned out differently the two of them would probably have had a good relationship with one another. The 'mischievous boy' of the Oda Army family is a lively lad who admires stylish heroes. Nobunaga's love of falconry was well known. A group of daimyou from other regions once presented him with the birds as a gift. The one which Nobunaga liked most was a white-flecked falcon from Oushuu. Though the real Ranmaru is usually associated with the image of a beautiful young man, Sengoku Basara portrays him as an unruly brat. YamamotoD had envisaged him as a spunky boy right from the very beginning of the design process. As they continued to work on his physical appearance, Tsuchibayashi Makoto, who was in charge of design, developed Ranmaru's 'naughty brat' look further. His face gradually became increasingly impish; he became more mischievous with every change they made. The interviewer remarked that Sengoku Basara's Nobunaga seemed very fond of this naughty brat. Since Nobunaga, Nouhime and Ranmaru almost seem like a family of three, could Nobunaga have fatherly feeling towards Ranmaru? YamamotoD answered that although it seems as though Nobunaga is acting in a fatherly way, there's another possibility which comes from that historical anecdote he mentioned before - Nobunaga could be thinking of Ranmaru as a beloved pet rather than a human being. As he said in the previous article, Nobunaga hasn't been portrayed as displaying many human emotions recently and Ranmaru hasn't appeared much recently either. As for Ranmaru, his feelings towards Nobunaga are much simpler; he's attracted to how 'cool' Nobunaga is! He's a kid and he loves powerful, stylish things. It doesn't matter whether a person is a hero or an antihero. The meeting between the two of them was depicted in Ranmaru's Sengoku Basara 2 opening movie. Ranmaru gets along well with Nouhime; they have a pure mother-child dynamic. She cares about Ranmaru in a maternal way and he's attached to her as well. In contrast, his relationship with Akechi Mitsuhide is terrible. They squabble like the characters from Tom and Jerry. To Mitsuhide, Ranmaru is an annoying brat - while Ranmaru considers Mitsuhide one of his underlings. Ranmaru's fighting style is different to (fellow bow-user) Tsuruhime in that he throws himself into his attacks and fights at point-blank range. Tsuruhime was created to be someone who makes an opening and fires her bow at a distance. Even though they both use bows, their play styles are completely different. The interviewer asked what would happen if Ranmaru ever met Tsuruhime, since in a way they're both pure children. YamamotoD laughed and said that the two of them are on completely different wavelengths. If Tsuruhime was the head of the student council at school, Ranmaru would be the idiotic boy running around the classroom. He'd probably call her stupid and refuse to listen to a single word she said. The interviewer asked what YamamotoD would like to do with Ranmaru in future. He answered that just like Nouhime, Ranmaru would have to be revived as a playable character first of all! Since the pair of them have been imprisoned by Mitsuhide in the world of Sengoku Basara 4, YamamotoD would like to show how the two of them escape behind the scenes one day. So Ashikaga's taking inspiration from the Kawanakajima duo eh? ;w; How wonderful! I still find it curious, though, that Shogun is synonymous with Emperor in SBverse. That'd certainly make things unusual for the Boshin War, though they're probably not even thinking of that which is fine, haha. As far as routes go, it seems like there will be enough room for everyone to have a creation and drama with some left over! I'd guess the 11 (I think?) characters without drama routes will get one, then a creation and drama for the 8 newly playable characters. That leaves 7 stories left over. 3 anime routes for the "cover" characters they're promoting and then one for either Motochika or Motonari and either Yukimura or Masamune (as per the clips we've seen), plus two more they can do whatever they want with... Niiice. I'm really interested in Ranmaru and the Oda clan as a whole historically so even if they're not my most favorite BASARA characters it's always fun to hear about the BASARA Oda clan. It's really wonderful that Yama acknowledges Nouhime does have a very human side... and he brings up a great point about Nobunaga's descent from being an evil arse into a true demon of sorts. Interesting they interpreted Ranmaru as they have. Personally I can't see the historical Ranmaru as being too much different from Musou Ranmaru (who I'm EXTREMELY fond of), so it was more than a tad jarring to see a bratty, boyish Ranmaru instead of a pretty young gentleman at first- but BASARA Ranmaru is still a lot of fun! Also neat to hear that they are still alive- I was always under the impression they were dead or something, so, that Mitsuhide has them locked up somewhere is a bit of a relief. The Matsu cook-off looks as though it will involve quite a few other characters which makes me happy; I hope you're right about everyone getting a drama route eventually but even if they don't, it's good to see people like Kingo and Keiji showing up and it gives everything more of a party atmosphere! Musou's Ranmaru is lovely. The Sengoku Basara version didn't appeal too much at first but he grew on me a few seconds after I discovered the fun of bludgeoning soldiers with a bow. I'd love to see him redone in the current system to see whether the storyline takes him one day. It seems as though YamamotoD is talking about the Oda forces a lot lately so perhaps he misses them too.